Dreamcaller Siren can only block creatures with flying. When Dreamcaller Siren enters the battlefield, if you control another Pirate, tap up to two target nonland permanents. 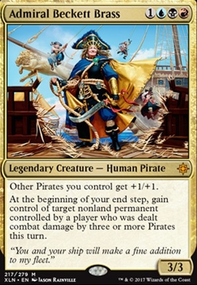 Argy I have tried Admiral Beckett Brass and found it is not very good due to the fact that the biggest weakness right now is Deafening Clarion and Admiral Beckett Brass requires a lot of pirates. In addition as a sort of tempo deck I prefer Dreamcaller Siren because it has flash. I will test out Fight with Fire and Banefire. I have not had a big need for a bigger play than a four drop but I am considering looking into it, when I built this deck I was very focused on the power of Pirates and only put Pirates into the deck, but I am open to ideas. Great point, I do find Dreamcaller Siren highly situational, Hope of Ghirapur is much better, totally forgot that I had those. Curious Obsession is probably better than Favorable Winds due to presence of dive down . Opt and Chart a Course are nice but I found that they slow down the deck a lot and with them it stands no chance against current meta aggro decks. Have you considered Dreamcaller Siren? So here is the thing. You only need about 40 or so cards that help pirates to make a deck feel piratey. And a lot of these pirates are kinda awful. 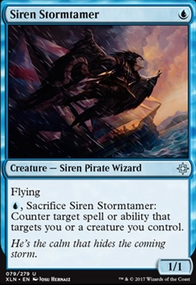 Creaturewise, I would cut Brazen Buccaneers, Cloud Pirates, Daring Buccaneer, Deadeye Tormentor, Dire Fleet Hoarder, Dire Fleet Interloper, Slippery Scoundrel, Storm Fleet Spy. They are pretty weak and their payoffs aren't great. Crafty Cutpurse is a fun pirate who can surprise answer a bunch of EDH strategies. Dreamcaller Siren has some interesting surprise tricks. Kukemssa Pirates lets you steal artifacts from people. Ramirez DePietro is the original badass pirate. Shapesharer is a pirate and lets you copy value pirates, such as neckbreaker. Changeling Berserker is a 5/3 pirate with haste who lets you retrigger ETB effects later. Adaptive Automaton is another lord to help buff your pirates. Land and mana wise, you want about 44 sources of mana. My rule of thumb is 38 lands, and 6-8 mana rocks for a 3 colour deck. Sol Ring is a staple as well. Signets, Commander's Sphere and stuff, all good. Path of Ancestry also gives a free scry when used to cast pirates. For enchantments, Call to the Kindred basically is a 2-1 as people kill it before it gets going and it doesn't have great odds of hitting a pirate. Curious Obsession, Navigator's Ruin, Swashbuckling, Trove of Temptation are all low impact or actively harmful. I would cut all them. Coastal Piracy is both thematic and rewards you for doing what you want to do. Attack. Kindred Discovery is less thematic but also helps reward you for playing pirates. For artifacts, you have a lot of eh ones. Pirate's Cutlass is a low impact card, but thematic. Sleek Schooner and Dusk Legion Dreadnought are so weak they aren't even worth playing. Captain's Hook is just +2/+0, menace, as your creatures all have the pirate typing. Door of Destinies is a powerful artifact in tribal decks that can get out of control pretty easily. Heirloom Blade is a more powerful, impactful weapon to equip your creatures with, as it also lets you chain through your deck. Herald's Horn lets you psudo draw more and gives a cost reduction. Obelisk of Urd is an anthem effect. Stoneforge Masterwork is an equipment that rewards a large boardstate. Skysovereign, Consul Flagship and Smuggler's Copter are both high impact vehicles who are good to tutor up, and from the new set Weatherlight fetches up artifacts when you deal damage which is fun. For your instant/sorceries, you want to be more high impact or efficient. Duress only hits 1 person in a multiple player game. You also want some flat out draw cards. This is more up to you, but Terminate is good removal. Jace's Ingenuity is solid draw. For more pirate themed spells, Spell Swindle and Brass's Bounty both are thematic and can be quite powerful, as well as push you to your alt win condition. Kittus, i've seen lists with artifacts, but i think that are excluding with the pirates, in a aggro deck probably you have to choose between the 4-drop candidates Zahid, Djinn of the Lamp and Dreamcaller Siren. 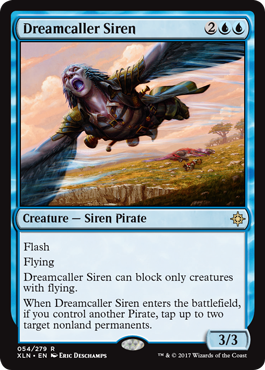 I like most Dreamcaller Siren because it gives you better tempo plays than Zahid, Djinn of the Lamp, and if it gets removal it's not a total loss, but i think that a list based on artifacts can work too, you need to add in mainboard Aethersphere Harvester and Aether Swooper and take out some pirates. I recommend using Chart a Course instead of opt mainboard because it draws you two cards when you attack. Given that this is a pretty aggro deck you'll be attacking a lot. 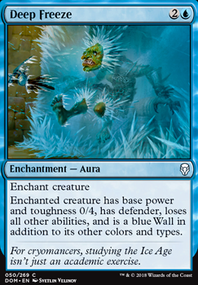 Also, take out the slither blades and put in Hope of Ghirapur mainboard instead. It benifits from favorable winds. Given that you have pirates Dreamcaller Siren should work better for you than curator of mysteries. You can drop it in and tap their flying blockers, letting you swing for even more. It's an awesome deck. Looks fun. 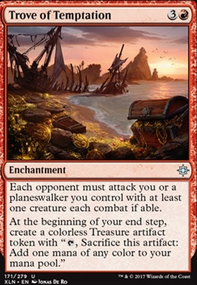 I suggest that you concentrate your deck on more of a midrange deck instead of adding the mill plan with Fleet Swallower and Navigator's Ruin. This would allow you to add more strong pirate creatures such as more Hostage Taker and Dreamcaller Siren. I also think that Sailor of Means isn't as strong as other pirates in the deck and could be removed for more copies of other pirates.